Republicans’ desire to unilaterally reduce the capital gains tax shows the difference between the parties. 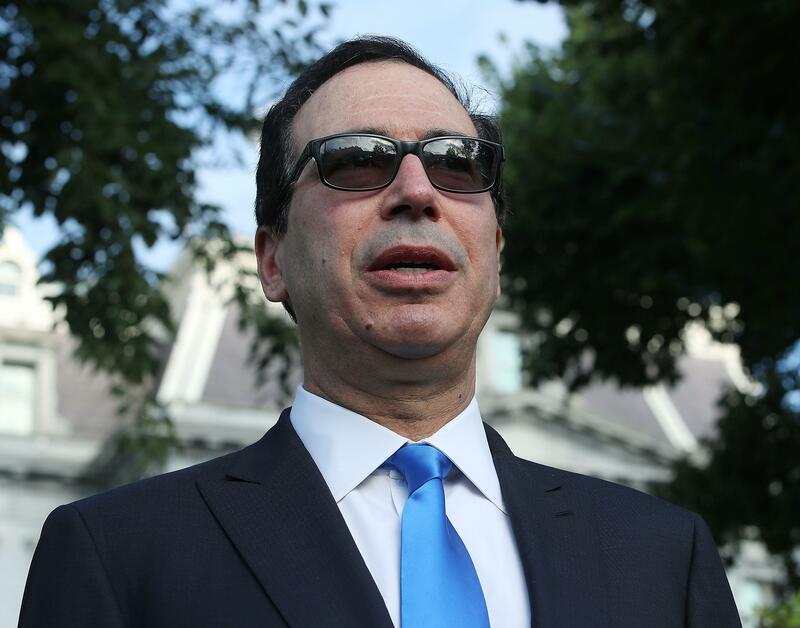 Treasury Secretary Steven Mnuchin speaks to the media ian the White House driveway on July 26 in Washington. That could be for a lot of reasons. The law is designed to benefit corporations and the richest Americans most. It reduced the corporate tax rate from 35 percent to 21 percent, and the top 1 percent of individual earners are expected to receive about 80 percent of the legislation’s gains. Many Americans are probably seeing somewhat higher paychecks but not enough for them to notice. There’s polling to back that up: In February, just a quarter of the public reported seeing a change in their paychecks in a Politico/Morning Consult poll. And the real proof in the pudding won’t be evident until tax time in April 2019. Recent polling tells us too that support for increasing taxes on the wealthy is high, as it has been for many years now. Sixty-two percent of Americans believe that the rich pay less than their fair share in taxes, according to Gallup. Last year, the Public Religion Research Institute found that 72 percent of Americans—including 74 percent of white working-class Americans and 58 percent of Republicans—support hiking taxes on those making $250,000 or more a year. Yet, according to the New York Times, the Trump administration is not only considering cutting capital gains taxes by $100 billion over the next 10 years. It’s openly floating doing so via an administrative mechanism that the George H.W. Bush administration deemed illegal. Treasury Secretary Steven Mnuchin said the administration was mulling a change that would allow taxpayers to account for inflation in calculating capital gains, reducing the amount of tax that would be paid when the asset is sold. It is estimated that around two-thirds of the benefit from this change would go to the top 0.1 percent of income earners. In a well-functioning democracy, doing such a thing, given the state of public opinion on taxes and the wealthy, would likely be politically fatal. Fortunately for the Republican Party, we live not in a well-functioning democracy but in the United States, and the Trump administration and conservatives backing this have surmised, correctly, that they can probably afford to publicly consider it on the basis of a few assumptions. The first is that most Americans aren’t paying terribly close attention to policy reporting at the New York Times or anywhere else. This is a safe bet at all times. The second is that the Republican base is willing to swallow just about any policy this administration pursues out of sheer antagonism toward the Democratic Party and the people it represents, who they believe might unravel the fabric of our country or upend the nation’s demographic balance, which is about the same as America’s fabric to them anyhow. The third is that the structural advantages the Republican Party currently enjoys—namely the composition of the Senate, gerrymandered House districts, the Electoral College—will help insulate them from the political consequences of proposing and implementing unpopular policy, as will their efforts to augment those advantages with policies that disenfranchise black voters. They are correct about all of this, and their self-confidence encourages them to pursue all kinds of unpopular initiatives, from tax cuts that disproportionately favor the wealthy and repeated attempts to repeal the Affordable Care Act, to culture-war projects like reversing Roe v. Wade and efforts to purge transgender people from the military. Very few people in America want any of these things. Their unpopularity might sting the GOP in elections like November’s midterms, but the party has an agenda to fulfill by hook or by crook and can rest on a stable foundation of considerable power even if they temporarily lose congressional majorities. The Democratic Party has no such foundation. It could build one up in a few ways. Structurally, the party could back the admission of new states, end the filibuster, and expand voting rights. It could ask its base to join the long-term project of defeating the Republican Party and the interests it represents, just as conservative politicians routinely tell their voters that liberalism ought to be stamped out. It could animate both voters who have long been ambivalent about going to the polls and Obama voters who chose to stay home in November 2016 with policies that sound fresh and that data has shown enjoy broad support across the country like single-payer or new proposals like a jobs guarantee. But Democratic donors and leaders alike are leery of these approaches. That might change. Until it does, our two-party system will house one and a half parties—one that has everything and the other in traction.